We are delighted to receive a Three Star Sustainability Rating from The Sustainable Restaurant Association (SRA) for the second year running. 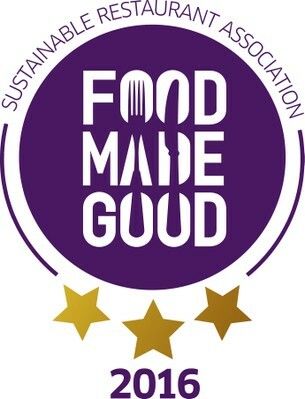 The SRA’s Food Made Good Sustainability Rating recognises organisations for their sustainability as well as acting as a tool to engage staff, suppliers and inform customers. The SRA awards One, Two or Three Food Made Good Stars against 14 key sustainability criteria, divided across the three pillars of Sourcing, Society & Environment and we are delighted to have maintained our Three Star rating. River Cottage HQ scored 88% overall, maintaining its Three Star Sustainability Champion status. The Sustainable Restaurant Association (SRA) is an organisation whose membership represents a broad spectrum of the hospitality industry all united in their commitment to sustainability. Lucy Lomas, Business Director, said: "This is fantastic news and a great tribute to the hard work of our talented and committed team. Sustainability is at the heart of everything we do at River Cottage, so we are delighted to have scored so highly against the SRA’s tough environmental and ethical standards." You can use our archive below to browse previous blog articles.